There's good news and there's sad news. Last night we got to see Eddie Izzard perform at the Coronet Theatre, a pretty small venue. He's one of my favorite comedians and definitely my favorite transvestite. Last night he wasn't in drag and was a bit scruffy. Still as funny as hell. I appreciate his humor because there is intellegence and knowledge of current events behind it. Thanks Ren for clueing me in that he was in town again this week. I knew I'd missed him last week and had no idea I'd get another chance! So, that's the good news. I needed a laugh and got several, sitting pretty close to one of the funniest men on the planet. And now, the not-so-good news. Moose, the dog best known for originating the role of "Eddie" on Fraiser, died last Thursday. He had a long life and enjoyed retirement for the past six and a half years. 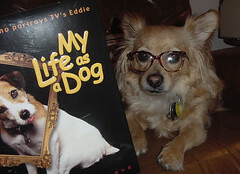 He was a published dog-author and Rusty and I thoroughly enjoyed his book. i read that about moose and it made me sad. but he had a good life. and as for eddie izzard...well...i like him in drag but he's pretty damn cute when he's scruffy too. sigh. I'M NOT EVEN SUPPOSED TO BE HERE TODAY! What?!? No More Drunk Dialing?!? Where Have All My Weekends Gone?